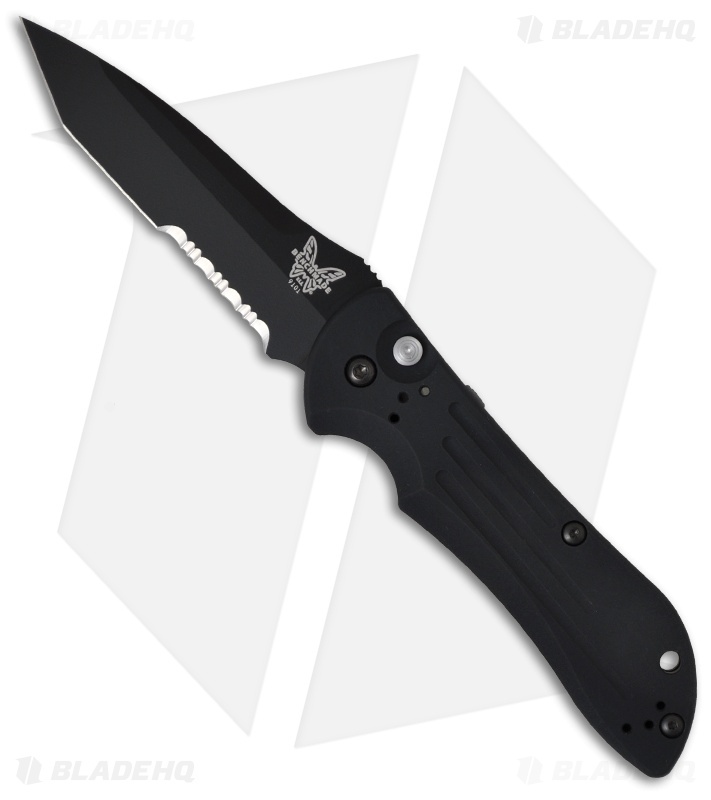 Be sure to view our other Benchmade 9101 Auto Stryker Knives in stock! The Benchmade 9101 Auto Stryker Knife is updated for 2011. This next generation Auto-Stryker knife incorporates a larger, stronger locking button for easier blade deployment, open back spacer design for easy maintenance, deeper index groove and increased spring force because we all like more power. What more could you ask for? The 9101SBK Auto Stryker features a push-button automatic mechanism with integrated safety. The blade is 154CM stainless steel with tanto blade design and a partially serrated edge. Black Cerakote™ Gen II blade finish. The handle is machined 6061 T-6 black anodized aluminum and also includes reversible tip-up pocket clip. Everything from the online ordering, to processing, shipment and delivery was on time and smooth. Order was processed within 48 hours as stated, and shipped to me on the easy coast in just two business days. The knife was also packaged very well. Attention to those things reflects very well on the company, so good job BHQ. As for the knife, it's perfect. Brand new with no flaws. BHQ is an authorized dealer, so you're in good hands. Couldn't do much better if you ordered factory direct. My best buddy bought me one of these as a gift recently and I have to say Benchmade hit it out of the park...yes it’s an old school Design from a top maker (Allen Elishawitz) design I believe.its not the hardest firing auto I’ve owned but it’s solid as heck and opens every time.i have zero complaints.shaving sharp out of the box too. I purchased this knife for every day carry. I had it about 8 weeks now, and fair to say I can write an accurate review. 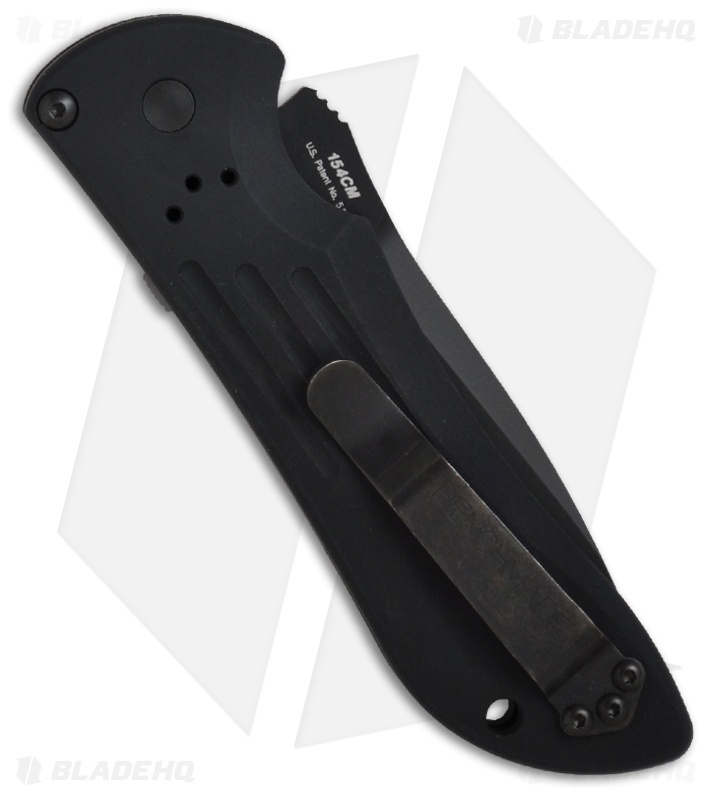 As an HVAC tech, I found this knife the best by far, that I ever purchased. I use it for everything from opening boxes to cutting rope. (serrated is great for that) the back portion is serrated about 1.5 inches. the knife feels very comfortable wearing it clipped to my right pocket. Cant even tell its there the clip has the perfect amount of tension. Clearly the finest workmanship. the automatic portion works unbelievable. now there is no need to chip a tooth, when I have my left hand for instance holding a tag line, with 50 tons dangling from a crane, that has to be cut in a hurry. I actually like it so much, I'm buying another one for my apprentice, so he don't steal mine. GREAT WORK BENCHMADE!!! !